The NFL Launches Official Twitter Tag For Super Bowl 44 "#SB44"
I would say that user generated content has moved to a new level of prominence in our society with the recent moves by the NFL. Straight from their official website, the NFL has launched a Super Bowl 44 Twitter montage for fans. This page basically aggregates the updates from Twitter that uses the NFL’s self proclaimed tag #SB44. Want to be a part of the official Super Bowl 44 Twitter montage on the NFL website? 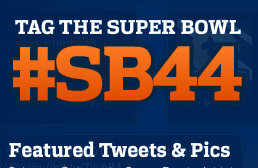 Just send out a tweet or picture with the tag #SB44 and you’re in. What’s amazing about this story is that the NFL is purposely not editing any of the content and Twitter updates. This shows the importance of social networking sites like Twitter, but more importantly, the relevance of integrating fans comments / user generated content into the NFL experience. Celebrate Super Bowl XLIV through the experiences of fans in South Florida and the rest of the world. Explore photos and tweets from fans tagged #SB44, the official tag of the Super Bowl. Want to be included in the experience? Make sure to include #SB44 in your Twitter posts and tag your photos on Flickr. Then come back often to see the excitement unfold! The content submitted by Twitter and Flickr users for this application is not edited, fact-checked or screened by the NFL before it is posted. The views and content of any Twitter or Flickr user displayed through this application are solely those of the applicable Twitter or Flickr user. If you see content through this application that you wish to report as a violation, click here to visit Twitter or click here to visit Flickr to report the violation. As a reminder, your use of Twitter in connection with this application is governed by Twitter’s terms of service and your use of Flickr in connection with this application is governed by Flickr’s terms of service and community guidelines. Please remember that your use of any photographs taken by you while in an NFL stadium must comply with the terms on the back of the ticket used to enter such stadium, which expressly prohibit the taking and transmitting of game action photographs. As a result, any game action photographs posted to this application may be removed by the NFL. So there you have it – the NFL is telling you that if you have a problem with anything you see on the montage, then take it up with Twitter or Flickr. The only time the NFL will step in is when you are in one of the NFL stadiums and trying to share photos. I’m excited to see if the #SB44 tag will make it to Twitter’s trending topics list. I believe it will, but I don’t think we’ll see until a few days before the game. Perhaps we can taking wagers on when we’ll see the #SB44 Twitter tag hit the trending list…. Let me start it off by predicting we’ll see #SB44 on February 4th – 3 days before the game. What do you think? When do you predict we’ll start to see the #SB44 tag hit Twitter’s trending list?